With new year out of the way and some painful dieting started it is time to think about my Waterloo project. By the time I get to play this it will be almost 3 years overdue so must crack on! As you may have seen from previous posts, all figures and buildings are now complete. Add to this trees, streams and roads which just leaves hedgerows and hill sections. As soon as I complete the painting of 6mm Wars of the Roses figures for the first battle in the 'Kingmaker' campaign I intend to do a stock check of all hills and hedgerows that I possess. I am cautiously optimistic that I have all that I need or at least close to it. Once that is done it is good to go. With regard to recreating the battlefield, I wanted to cover as much of it as possible. So often you see in wargames the battlefield being limited to opposing ridge lines. I wanted to add depth which is where the benefit of 6mm comes in. The wargaming table will total 7'6" x 6' split into 2 sections. My main wargaming table being 7'6" x 4'6" and then a separate section which will sit across my painting table. Unfortunately I have to shorten this slightly due to the shape of the room so it will be 6'9" x 1'6". Sods law dictates that I lose 9" from the Prussian entry point. I had considered offsetting the narrower section but decided against it as I felt it would be visually better to be fully aligned. This narrow section will include Plancenoit and the initial Imperial Guard position through to the edge of Rossomme. Each square on this map is 26mm x 23mm and gives the Prussians that little extra space to deploy. I have not decided for certain but this latter option is probably the most likely I will go for. I will provide further updates in due course leading up to the game itself. A most grand project. The square distortion is a good idea. Thanks Norm. Yes I think it is about as far as I can push it without affecting the battlefield too much. Hopefully it will not be noticeable once set up. The Prussians are always the challenge to fit on in any scale! A bigger table! I wish. Like you say even in 6mm this could be a little tight. 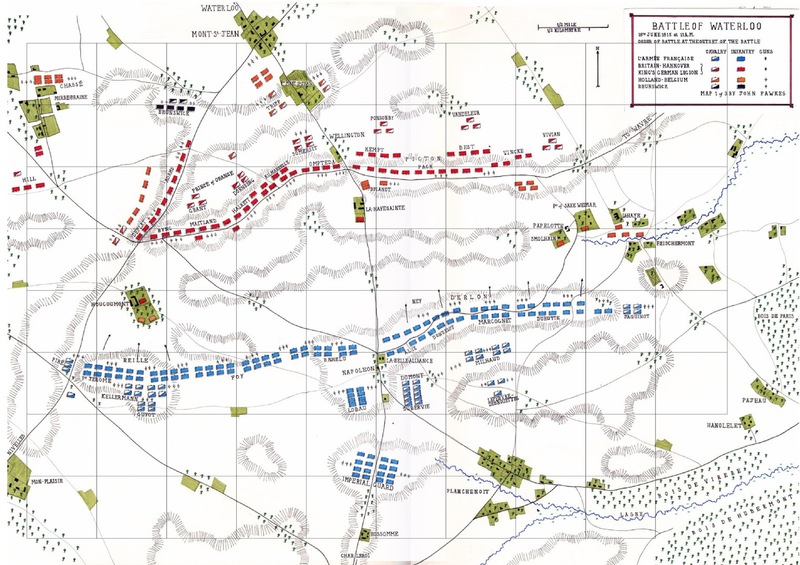 I will not know for certain until it is all set out but I am cautiously optimistic it should be ok.
On the map/table distortion, will condensing the width of the battlefield still allow all units to deploy on their historical frontage? Hi Jonathan. This is a problem that has been vexing me. For the French, battalions deployed in column of divisions (2 bases wide) it should be ok if a little tight. For the allies, they had a problem with space in reality with reports that some British battalions formed line of 4 ranks deep rather than 2 due to lack of space (many were in column at the start). I will almost certainly do that with the larger battalions in particular. To sum up, it is my intention to get it as close to historical deployment as possible and worst case scenario, it may mean adjusting the odd battalion here and there. Although I have measured up my units, deployment areas etc. it will not be until I have actually laid out the battlefield that I will know for certain. Thanks for your interest and your post.